My thoughts are with you as you work through the issues and move forward with your life. Thinking of you dear Stephanie. Heroise looks beautiful in her new sweater. Heloise is a such a beautiful girl and her new sweater makes her divine. You must be very proud of her. Héloïse makes the perfect angel and she looks beautiful in her gorgeous sweater, it's definitely 'her' colour. 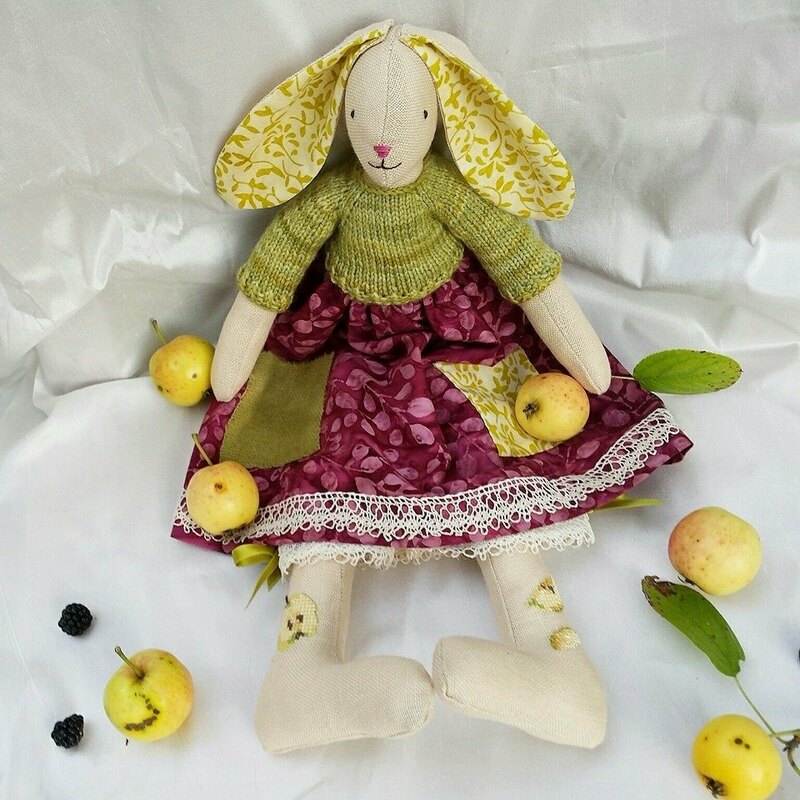 I always think of her when I look at her lovely little bunny illustration that sits in my craft room. You are in my thoughts too lovely lady, happier times are ahead, just hold on to that! My dear friend. I was just thinking of you this morning....truly! Many times when a blogger pal comes to mind in the early morning, I find that she has just posted. I am coming via email. Your daughter, how gorgeous is she. How brave you are. My dear Stephanie, my heart and prayers go out to you for strength and to keep your fighting spirit. You are a brave woman and have to be for yourself and for your children. Life is not fair that is for sure. You need to be kind to yourself, and let no negative messages into your sensitive soul. I am here for you if you need a chat or a shoulder to cry on. Your daughter gets more and more beautiful every day. Dear Stephanie, I send you my very best wishes as you continue on your path to a happier future. I am glad that you have caring folks, like lovely Heloise, around to support you. 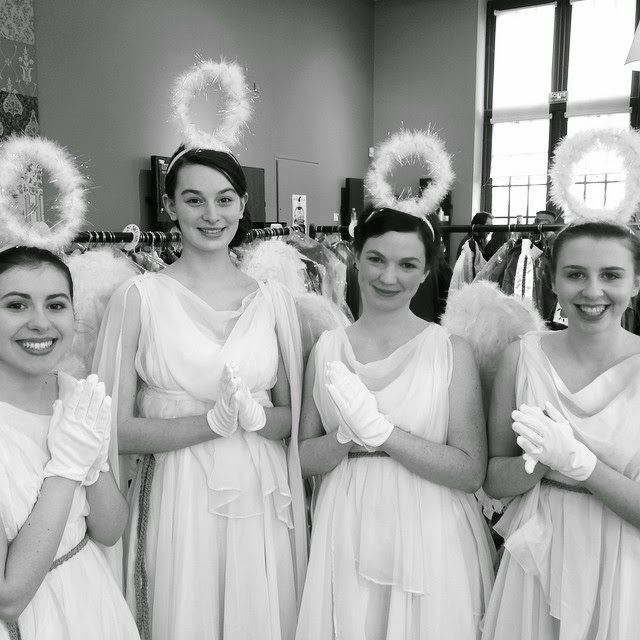 Congratulations to Heloise on her angelic role and Happy Birthday to her, too! The Venetian colorway is one of my favorites in that marvelous yarn. How well it suits the design, and how beautifully it suits your beautiful daughter. Dear Stephanie, my heart and thoughts go out to you at this difficult time. May the love and support of those who really care give you the strength to continue on the path to happier times and remove the hurt from your heart. Wonderful photos of your beautiful daughter Héloïse in her lovely sweater and as an Angel, I am so pleased you have her love and emotional support. Gorgeous sweater which suits your beautiful Heloise totally...colour and all. I do particularly like the pattern at the back of the sweater....different. I hate to hear you are having such a difficult time and hope it will be settled soon and can look forward to happier times!! A beautiful sweater and a beautiful girl. Terrible times for you, but you have your beautiful daughter, love the sweater, and didn't she make a beautiful angel. Sending my small but steady flame to add to the light that is surrounding and uplifting you. Know that many, many care for you and keep you in their thoughts. And I, especially, lovely lady. Hold fast to the beauty in your life. It endures and outlasts any of the hurt or sadness. Ah, dear Stephanie, I have been there. As my dear departed Dad advised me, remain true to yourself, and you will come out of it in a better place. I did and I placed a different emphasis on my relationships after that. The love of your children and your own self worth will get you through. Dear Stephanie - what is there to say but that we love you and are here for you? Beautiful daughter, beautiful sweater. Beautiful YOU, inside and out. I have been worring about you since your last post and was hoping for happier words, happier times for you. I wish these will come soon. I hope you'll be alright. You are a wonderful person, a talented and beautiful woman... if you ever need a friend, I'm not that far. Héloïse is a beauty! as an angel as well as a spring fairy (I love the colour of your sweater, just perfect for her). Much love to you and your charming children. I'm sorry you're having such a hard time right now. I hope there will be better times soon. This sweater is beautiful and your daughter looks lovely in it. Take care and know that we are all thinking of you. Thinking of you and somewhat relieved to read a post even if things are still in limbo. Amazingly you can still produce beautiful makes and photos. Stay strong and one day this period of your life will just be a distant memory. dearest stephanie, I'm praying for you, sending your strength, hope and better days ahead! I am sorry you are going through something right now. You will emerge stronger, wiser, and victorious in other ways. Keep your head up, girl. Gorgeous young lady there in a wonderful jumper. Dear Stephanie, I am so sorry you are in this situation. I am sending you hugs filled with love and hope that you will get through this as I know you can. Heloise is a beautiful young lady and I'm so glad you have her to help you. Héloïse is such a beauty, the pullover you made is perfect and well done to her on her first TV role ..... that is quite something! btw I'm now going to find the pattern for that beautiful sweater... I love the pointy shape at the back! I am saddened to know that life is being made so difficult for you - may there be light around the corner soon for you. You have a lovely family who must be of great comfort to you. I'm sending you good thoughts and best wishes from Michigan. Bad things pass away. May all that's troubling you pass away quickly. How very stunning Stephanie... Wonderful pullover for your wonderful, wonderful daughter. You have been in my thoughts, and like so many of your friends I have been sending loving thoughts your way every day. Please know that you are loved and supported from all corners of the world. How very beautiful your daughter is. They are blessings aren't they, daughters, and sons. This is verey informative site for amour. I always try to found this type of information. I think It's really heplful for who want to know amour.